COVINGTON —- Wins have been hard to come by for the Covington Buccaneers as they had won just one in the last 12 games before hosting Tri-Village on Friday. But through that frustrating stretch Covington has had a few heartbreakers – close game where it just couldn’t get over the hump. The losses never came due to a lack of effort – but rather a lack of being able to take advantage of opportunities. On Friday, the Buccaneers were able to take advantage of opportunities against Tri-Village and the result was a thrilling —- and very rewarding —- 51-49 win. And much like Covington’s season has gone, senior Tyler Fraley faced adversity and frustration head on by controlling what he can control – playing hard to the end and let the chips fall where they may. Fraley scored Covington’s first five points of the contest on a trey and a runner, but managed just two more points through the second and third quarters. He had open looks, but shots just wouldn’t fall. But he contributed in other ways, playing defense and distributing the ball to teammates for easy buckets. It was unselfish play and the Buccaneer senior was rewarded in a big way when the game was on the line. Fraley managed to get off the scoring schneid with a three-pointer from the corner early in the fourth quarter, but his biggest play came after Tri-Village’s Layne Sarver drilled a three-pointer to tie the score at 49-49 with 49 seconds left in the game. After Covington dribbled the clock down to 16 seconds and called a timeout to set up a strategy, Fraley found himself with the ball in his hands at the elbow as the clock ticked away. Looking to pass with two Patriot defenders collapsing his way, Fraley couldn’t find an open lane to distribute the ball. Instead of forcing the issue, the Buccaneer senior took a pivot, split the defenders and drove to the basket for a contested layup to put Covington on top 51-49 with 6.5 seconds left on the clock. Tri-Village immediately called a timeout and then put the ball in the hands of senior Derek Eyer, who led all scorers with a game-high 28 points. Eyer drove the length of the floor, but Covington’s defense was able to cut him off at the three-point line – forcing Eyer to make an errant pass to the corner that bounced off of a teammates hands and into the wall with 0.7 seconds left. Covington then inbounded the basketball and held for the buzzer to preserve the thrilling 51-49 win. Fraley, who hit the game-winning shot, finished with 12 points and can stake his claim of hero status by stepping up in the clutch —- but it was a team effort across the board that got the job done for Covington. 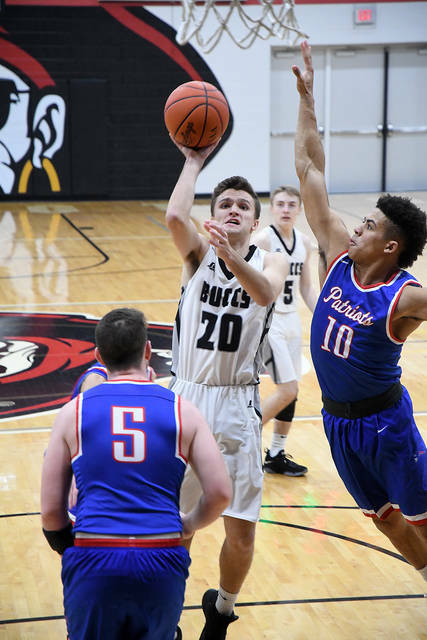 Derek Eyer torched the Buccs for 19 points in the first half and 26 points through three quarters, but in the second half Covington adjusted its defense. Between Andrew Cates, Spencer Brumbaugh and Chad Yohey rotating in defending the Tri-Village star, Eyer was only able to score one bucket in the final frame. The defensive effort in shutting down Eyer changed the game as it forced Tri-Village to look elsewhere for points. 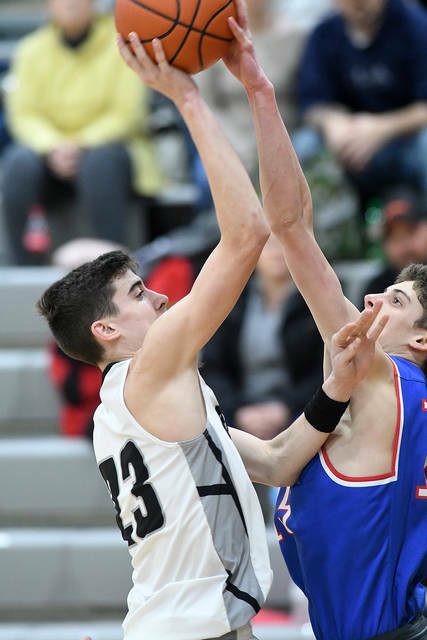 And the Patriots weren’t able to find much offensive success as they could only muster three total field goals in the final frame – a jumper by Gage Hileman, an Eyer bucket and the clutch three-pointer by Sarver with 49 seconds left in the game. Outside of Eyer, no other Tri-Village player was able to score in double figures. For Covington, Kleyton Maschino led the way with 16 points, while Andrew Cates and Tyler Fraley finished with 12 points each. The win improves Covington’s record to 4-14 on the season and gives the Buccaneers some confidence that they can get over the hump as long as they continue playing hard for four quarters. 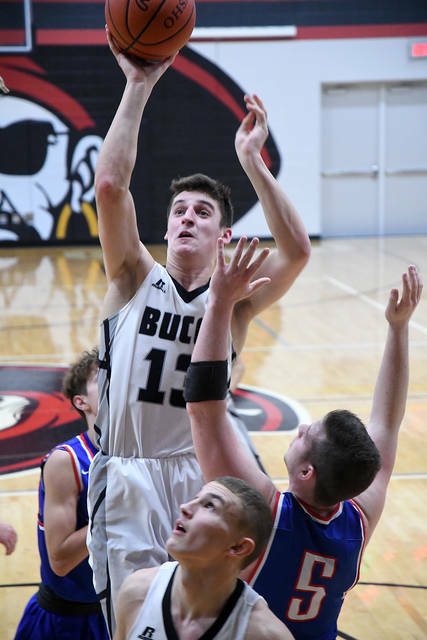 The Buccs hope to build on the momentum on Tuesday as they host Sidney-Lehman in non-conference play.